Stamp the Frame Boxes 6 up on white cardstock. Line up the 6 Up Stencil over the lines. Using the Texture: Grid stamp, add the image to the inside of each square. for the sentiment. Mat on red cardstock and then the yellow card base. Stamp sentiment on white cardstock and trim out. Adhere to empty square using foam squares, for added dimension. Speckle with black ink or paint. Easy and so cute!!! Darkroom Door: Texture: Grid, Frame Boxes 6 Up, Brushed Sentiments, Carved Birds Vol. 1 & 2. Ink: Archival: Fern Green, Cobalt, Saffron, Red Geranium and Jet Black. drying time. Stamp the Texture: Grid stamp in the center of the card. Stamp the carved birds in a stacked position. card to create when you don't have much time. Speckle with black ink. Darkroom Door: Texture: Grid, Carved Birds Vol. 2, All Occasions. 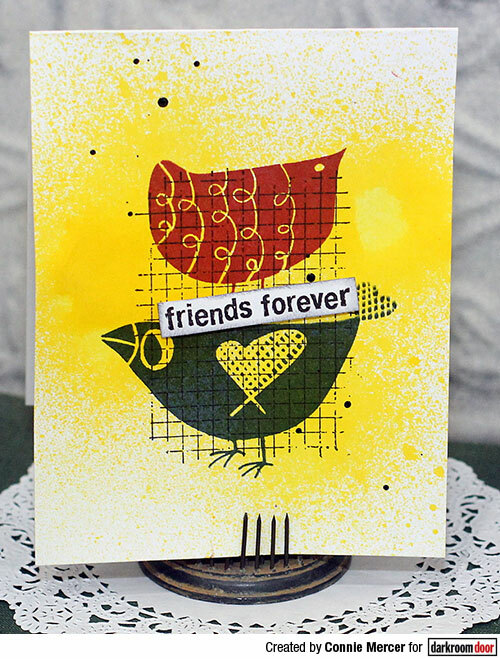 Using two diffrent colors of Archival ink and the Polka Dots Stencil by Darkroom Door, create a background for the card base. Stamp leaves randomly around the card front. Stamp the Texture: Grid in the center of the card. Stamp one of the large Garden Birds, on white cardstock, and trim out. Shade the Garden Bird with Archival inks. for added dimension. Speckle with black ink or paint. 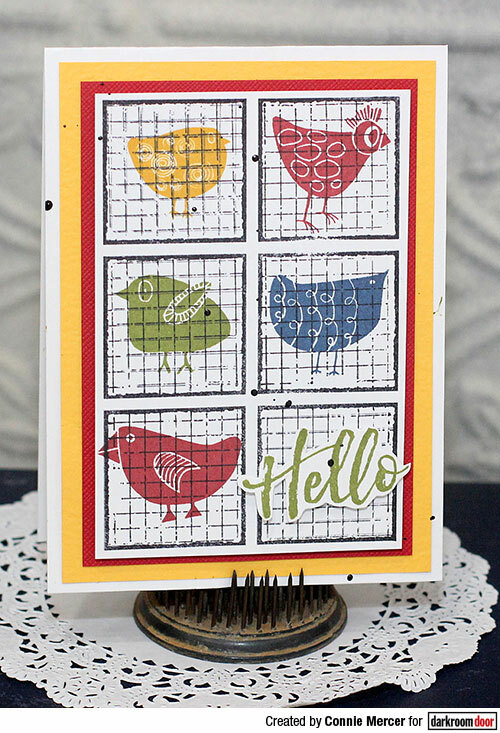 So clever and cheerful...I love those birds and using the grids on top - Super cute Connie! Love that new Grid stamp! Great combination with the birds! Beautiful cards Connie! These are all GORGEOUS! LOVING the birds and the colors!!!!!!!!!!! 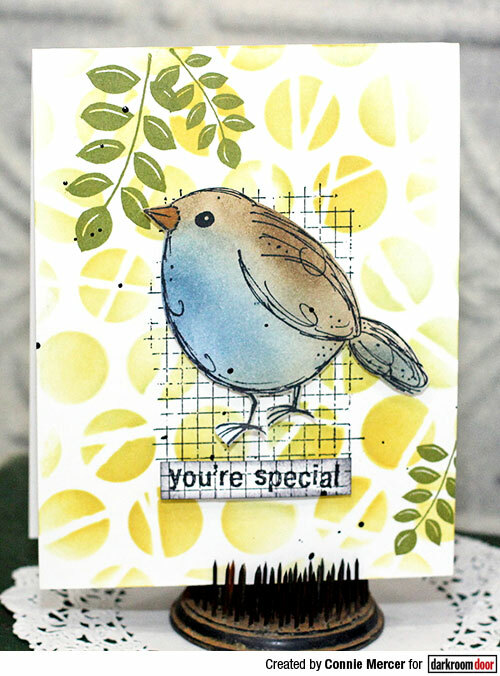 Love how you used that grid stamp- adorable cards!